What are emollients in cosmetic formulas? This month we are focusing on cosmetic raw materials and in this post we’ll talk about emollients. In a previous post we talked about the three different kinds of cosmetic ingredients including functional, aesthetic and claims ingredients. Emollients would be considered functional ingredients. Specifically, they would be considered ‘conditioning’ ingredients. The term emollient refers to materials that are able to soften skin. The word is actually derived from mollire which is a Latin verb meaning “to soften.” In the cosmetic formulating world emollients are ingredients incorporated into products to improve the feel of skin and hair. Use of these ingredients for cosmetic purposes dates back to the earliest days of recorded history. Emollients are a class of ingredient with a wide variety of molecular structures. They are typically non-polar materials and come from both natural and synthetic sources. Most of the oldest cosmetic ingredients come from natural sources. This makes sense because synthetic chemistry wasn’t invented. Humans may have stumbled on methods for synthesizing soap and alcohol but it would be years before we actually knew what was happening. For this reason people took ingredients that nature already made and applied them to hair and skin. The most common natural emollients, triglycerides, are plant and animal fats and oils. These ingredients are made up of three fatty acids attached to glycerin. When the triglyceride comes from a plant it is referred to as an oil. That would include materials like coconut oil, soybean oil, palm oil, etc. When the source of the triglyceride is an animal the ingredient is often referred to as a fat. Examples include lard and tallow. But animal triglycerides are also called oils including shark liver oil and mink oil. Triglycerides have different characteristics such as melting point, oily feel, compatibility with other ingredients, and the ability to penetrate the skin. When formulating with these ingredients you have to experiment to find which of these works best with your formula. In general, triglycerides will feel more oily than other types of emollients. The characteristic responsible for the differences among triglycerides is the distribution of the fatty acids in the material. As stated previously, triglycerides are composed of fatty acids. Fatty acids are hydrocarbons with varying number of Carbon and Hydrogen atoms. Different triglycerides will have differing compositions of fatty acids. Coconut oil has a high level of 12 Carbon fatty acids. Palm oil has a high level of a 16 carbon fatty acid. 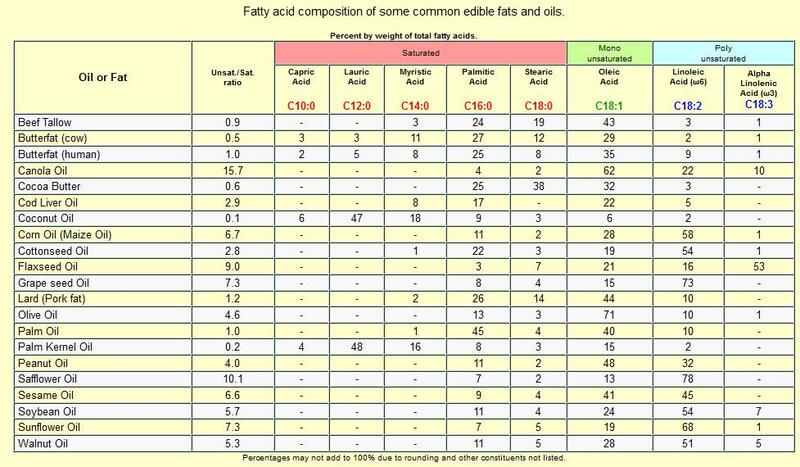 This chart shows the fatty acid distribution of different types of natural oils. It’s important to note that a number of cosmetic raw materials are derived from triglycerides. This requires the material to be chemically modified to separate the fatty acids from the glycerine. The free fatty acids are used to create emollients called esters which we will discuss shortly. Lanolin is an emollient derived from sheep’s wool. It’s like the sebum that is naturally formed on your scalp and is a by-product of wool production. While some people object to the use of animal based triglycerides because obtaining it requires the killing of animals, lanolin may be less objectionable because sheep are not harmed in collecting it. Lanolin is a molecularly more complex molecule than triglycerides. It is mostly non-polar and comprised of a complex mixture of esters. It is a soft solid at room temperature that melts at 40C. Lanolin has gives a nice feel to skin and hair and has been used since ancient times. The material can be further separated to form lanolin oil which is liquid at room temperature. Lanolin can also be chemically reacted with other materials to form derivatives with various characteristics. If your formulating allows you to use animal based ingredients, lanolin is certainly a good emollient to use. While people don’t think of something derived from petroleum as natural, it certainly isn’t synthetic. Mineral oil comes right from the ground and is actually one of the most commonly used emollients. It is a complex blend of hydrocarbons and can actually refer to a number of different materials. This slide presentation on mineral oil is interesting. Since natural emollients can feel oily and greasy and create stability challenges for formulators, synthetic chemistry has come to the rescue. There are a wide range of emollient esters created for formulators to get all the benefits of without those drawbacks. The most common synthetic emollients are emollient esters. If you recall from organic chemistry course esters are created by reacting an alcohol with an acid. Those fatty acids that were chemically removed from the triglycerides are reacted with various alcohols to produce some fine emollients. The characteristics of these esters are a result of the fatty acids used to make them, but they are also influenced by the composition of the alcohol portion of the molecule. The best known of the simple esters is isopropyl myristate. That is the molecule resulting from a reaction with Isopropyl Alcohol and Myristic Acid. It is liquid at room temperature but also provides a non-oily feel. A wide variety of esters can be made just by changing the composition of the alcohols and acids that are reacted. In general, a longer fatty acid will result in an ester with a more oily feel. Simple esters are composed of an acid and an alcohol. But more complex esters can be created using molecules that have multiple acid or alcohol functional groups. The chemistry for making these ingredients was developed in the lubricant industry so there aren’t a lot of these that have been adapted to the cosmetic industry. Examples include dioctyl sebecate and dioctyl maleate. They are very light feeling and non-greasy. Other more complex esters are produced with molecules that have multiple alcohol (-OH) groups. The simplest is ethylene glycol which is reacted with acids to produce materials like Ethylene Glycol Mono Stearate (EGMS). This material is solid at room temperature and is used in many formulas to produce a pearling effect. Ethylene glycol can be polymerized to produce very high molecular weight emollients that have the added benefit of being thickeners. PEG-150 distearate is an example of this. There are many different options that raw material manufacturers can choose to produce different kinds of emollients. And they do. I remember being overwhelmed by the choices of emollients available. You have to find one that works for you and stick with it. The reality is that consumers usually can’t tell much difference between an emollient like mineral oil and olive oil. When you are formulating with emollients here are some of the characteristics you need to consider. Would you like to know more about formulating with cosmetic raw materials? Consider taking our Practical Cosmetic Formulating course. how i send information to site ?